We began working with St. Francis in 2013, when we first developed a marketing and brand strategy to promote their transfer/adult education, undergraduate admissions and campus news. Prior to our work with them, St. Francis was purchasing data lists and sending postcards. Due to budget constraints, they were only able to send pieces to 50,000 households. Working with our consulting team, we were able to increase the targets to 125,000 households and nearly double the size of the piece — all for the same cost of the smaller quantity and sized cards they were doing previously. 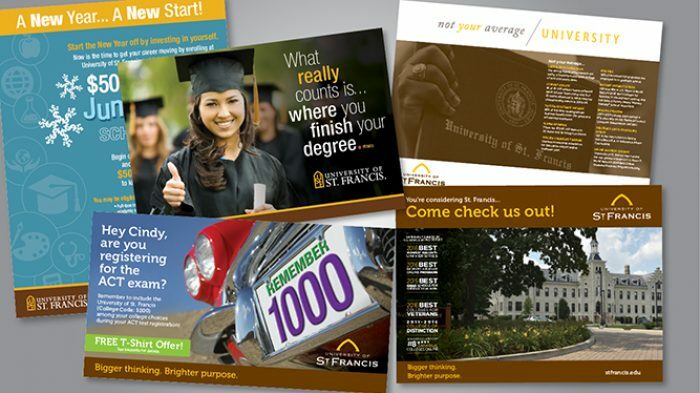 Additionally, our data and mailing experts helped the St. Francis staff target communications to areas from which 75% of their students matriculate — increasing the effectiveness and ROI of the marketing strategy.